I had never really listened to Sunflower Bean when my dad text me one day saying he had bought us tickets to see them- little did I know he had bought us tickets to the Newcastle show, as well as Leeds and Manchester; I was a little apprehensive at the time about going to all three (and I was still recovering from jet-lag), yet after seeing them perform for the first time, I knew I had to go and see more. What I learnt about the Brooklyn trio over the three shows is that they thrive off a energetic crowd, each member brings a complete sense of individuality to the show, and they’re all very humble and appreciative of the support from their fans. I was lucky enough to meet the band on all three nights, as they took time out after the show to come down and meet everyone as we lingered by the merch stand. While I was beginning to feel a little bit ‘stalker-ish’, they were all very friendly and spoke to us about the upcoming shows and took interest in where we were from. The crowd were already pretty pumped when Sunflower Bean arrive on stage; there’s a strong ratio of a younger crowd, yet there’s a strong presence of older folk here; that’s the great thing about Sunflower, their music appeals to such a wide range of people. Nevertheless it is evident that every person in the crowd is full of energy, with a mosh pit and a lot of crowd pushing from the get go. Sunflower thrive off this kind of show, and it’s not long before they’re interacting with the crowd and Julia (vox/bass) confidently jumps into the pit during her solo. If I do say so myself, Newcastle did set the bar and it would have been hard to overtake such an enthusiastic crowd- that were even complimented by the band. Let’s be honest here- Leeds disappointed me a little. This is not a critique of Sunflower at all, but rather I expected much more from the crowd, especially as we were in the student centre of the Leeds. To put it lightly, Sunflower played fantastically as usually, however it wasn’t a show, and unfortunately it just didn’t give me (or the band) the enthusiasm that we had experienced in Newcastle. It is true what they say, a band will feed off the energy that the crowd gives them- which Sunflower just was not getting; which is evident as there was sadly no encore. On a more positive note, it proved a very interesting choice of venue and Sunflower smashed it with their phenomenal music abilities. Just when I thought I had experienced all the weird and wonderful music venues of the North, I visited The Deaf Institute; I loved the historic feel and intimacy of the building, which made it the perfect place for my last show with Sunflower Bean. When I spoke to Sunflower after their Leeds show, they had told me that they were very psyched up for their date in Manchester, and boy did Manchester deliver. I can’t say it matched the same level as Newcastle, but they did a pretty good job. Nevertheless, Sunflower thrived off the crowd’s energy, and Julia even made her way into the pit, which simply made the crowd explode. Big props to the guy who was obviously a die hard Sunflower fan (although Nick and Julia were far from impressed when they were, I’m assuming by accident, hit by your shoe). Overall, Sunflower Bean were incredible- I love their album but they’re a type of band that just bring something completely new when they’re playing a live show: so much charisma, energy and even a more enhanced sound in comparison to their album. While still a pretty new band to emerge in the UK, it is obvious they have found their sound perfectly, rightfully earning their place on radio playlists such as BBC Radio 1, smashing it with tracks such as ‘Wall Watcher’ and ‘Easier Said’, just to name a few. I believe what makes Sunflower unique, especially in their performance, is that you can see the distinct individually of each band member, while still blending perfectly together. 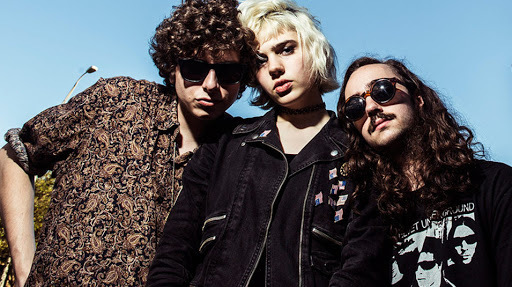 It has been obvious from following Sunflower Bean on tour that they greatly appreciate their equally appreciate audiences, that they will be coming back bigger and better, and I can’t wait to see what’s in store for their future. So don’t worry if you missed Sunflower on tour this year, they did promise me that they’ll be returning to the UK on tour in 2017. See you then.